In a new paper online this week in the journal Science Advances, Robatjazi and co-authors with Rice's Laboratory for Nanophotonics (LANP) describe how pseudomorphic replacement, the same chemical process that turns a tree to stone, aided their synthesis of the first metal-organic framework (MOF) around light-powered aluminum nanocatalysts. Catalysts are materials that speed up chemical reactions without reacting themselves, and they're used in the manufacture of most commercially produced chemicals. Because most industrial catalysts work best at high temperature or high pressure or both, they also come with an enormous energy burden. The combination of MOFs and plasmonic aluminum creates a new avenue for designing greener catalysts that use solar energy and are made from the most abundant metal in Earth's crust. In the study, Robatjazi, LANP Director Naomi Halas and colleagues performed a proof-of-principle demonstration of a process known as the reverse water-gas shift reaction at ambient temperature and pressure under laboratory conditions that simulated sunlight. The reaction transforms carbon dioxide (CO2) and hydrogen gas into carbon monoxide -- a feedstock for chemical manufacturing -- and water. "This is the first example showing that you can combine MOF and aluminum particles to do this reaction with light," said Robatjazi, a graduate student at LANP, the Rice lab that has pioneered plasmonic technologies for applications as diverse as cancer diagnosis and treatment, MRI contrast agents and solar water distillation. Plasmons are waves of electrons that slosh across the surface of tiny metal nanoparticles, and by varying a plasmonic nanoparticle's shape and size, LANP scientists can tune it to interact with and harvest energy from light. In previous research, LANP demonstrated copper nanocatalysts for making clean-burning hydrogen from ammonia, and aluminum-based antenna-reactors for making ethylene, the chemical feedstock for polyethylene, the world's most common plastic. "We've shown that growing MOFs around aluminum nanocrystals enhances the photocatalytic activity of the aluminum particles and also provides us a new way of controlling the size, and therefore the plasmonic characteristics, of the particles themselves," Halas said. "Finally, we've shown that the same basic method works for making different kinds of MOFs." In Robatjazi's initial experiments, he attempted to grow MIL-53, a well-studied MOF that's noted for its CO2-trapping ability. He tried synthesis methods that had worked for growing MOFs around gold particles, but they failed for aluminum, and Robatjazi suspected aluminum oxide was to blame. "It's amorphous," Robatjazi said. "It's not like a flat surface with a well-defined crystallinity. It's like a bumpy road, and the MOF crystals could not make a structure on that surface." "We learned from Mother Nature, and we basically use the same strategy because aluminum oxide is a mineral," he said. "Normally for MOFs, we mix a metal ion with the organic linker, and in this case we eliminated the metal ion and instead dissolved the aluminum oxide and used the aluminum ions from that reaction as metal components of our MOF." By varying the reaction conditions, Robatjazi found he could control how much of the aluminum surface he etched away, and thus control the final size -- and plasmonic properties -- of the plasmonic particle inside. For MIL-53, the CO2-trapping MOF, he showed that the catalytic activity of the plasmonic aluminum nanocrystal increased substantially when the MOF was in place. 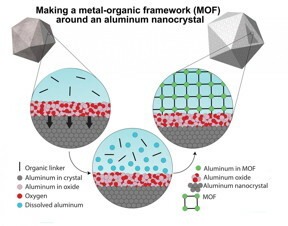 "We're exploring avenues to tune the characteristics of aluminum-MOF structures, either by synthetic variation or post-synthesis modification," Halas said. "That flexibility could open a range of opportunities for scaling up plasmon-mediated chemical reactions that are both less expensive for industry and better for the environment." Halas is Rice's Stanley C. Moore Professor of Electrical and Computer Engineering and professor of chemistry, bioengineering, physics and astronomy, and materials science and nanoengineering. She also is director of Rice's Smalley-Curl Institute. Robatjazi is a doctoral student in Rice's Department of Electrical and Computer Engineering. Located on a 300-acre forested campus in Houston, Rice University is consistently ranked among the nation's top 20 universities by U.S. News & World Report. Rice has highly respected schools of Architecture, Business, Continuing Studies, Engineering, Humanities, Music, Natural Sciences and Social Sciences and is home to the Baker Institute for Public Policy. With 3,962 undergraduates and 3,027 graduate students, Rice's undergraduate student-to-faculty ratio is just under 6-to-1. Its residential college system builds close-knit communities and lifelong friendships, just one reason why Rice is ranked No. 1 for lots of race/class interaction and No. 2 for quality of life by the Princeton Review. Rice is also rated as a best value among private universities by Kiplinger's Personal Finance. To read "What they're saying about Rice," go to http://tinyurl.com/RiceUniversityoverview .